I would love to just lie to you up front. Make you believe that this was in my plans. Dreams perhaps, but not plans. LOVE it!!! I will smock just about everything that doesn't move, but even I know I could never justify this. Not when there are a zillion other things I want to get smocked and can't sleep at night for planning. Of course it doesn't hurt that it is in one of my favorite color schemes. Pink and green. A preference that was almost obliterated when youngest daughter was in college. Her sorority colors were pink and green. So there was a lot of it around. But I must really like it, because 4 years of saturation didn't turn me off. This perhaps would be a time when even I would use :gasp: machine smocking. No, not going to happen. More than the reason that I am not a fan of machine smocking; I HATE, (did I say that loud enough?) home dec sewing. HATE, HATE, HATE! I would be one of those fools who would plunk down hard earned money for someone else to do it. Except that the price for someone else to do it, would far exceed the value needed for a port a crib at Mimi's house. Sigh, it is beautiful though. A girl can dream. Absolutely to die for beautiful!! I made the crib bedding for my grandson (not smocked, mind you) but cute nonetheless. It was a lot of work and nearly killed me when the time came that they had to be removed from the crib!!! Oh my land! I made my babies' crib bedding too but I didn't smock it. I wish I had at least done a pillow. I went back and looked at her other photos. Did you see she did a blue boy set too?? That is not one but TWO smocked crib bedding sets!!! Wowza! Actually, I just came across lots more pictures of hers. She must do it as a business. That is really amazing. Thanks for showing us her picture. 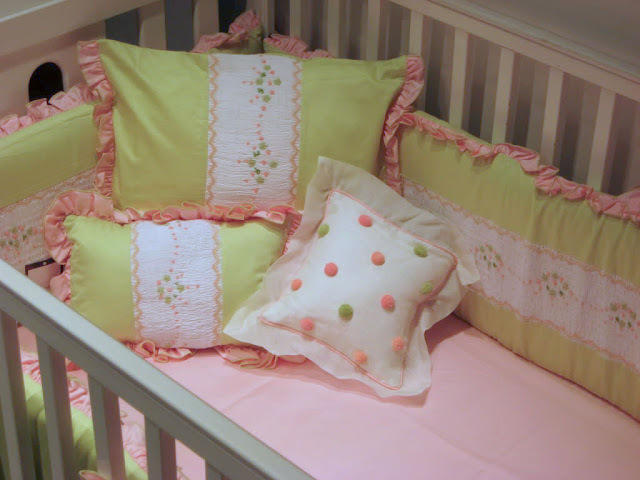 I had never heard of smocked crib bedding before but now I'm dreaming with you! At first I thought it was just a couple of pillows and then I saw what you were talking about. Wow! That's beautiful! Not something I'd try, but very beautiful! Hmmm Martha, What have YOU been making for that upcoming little one?? And I have two new grands on the way to sew for right now, but I'm not doing that either. I'm having trouble keeping up with the sewing for the five that are already born into the world. How will I ever sew for seven?